We've been fortunate these first three Sundays in (but not of) Lent to worship in parishes that use some form of Cranmer's Great Litany from the Book of Common Prayer. 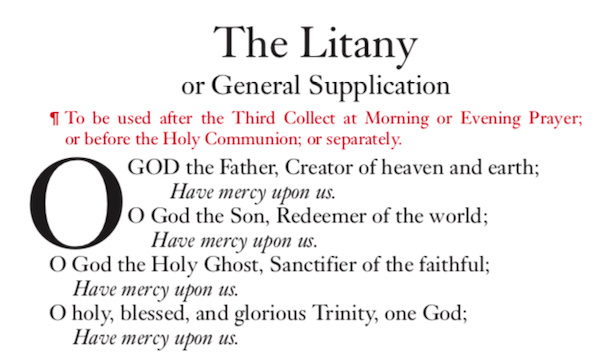 The Litany was the first of the reformer's liturgical projects to be published in English, appearing in 1544—a curious in-between time for European religion. The 1534 Act of Supremacy had asserted a decade before that Henry VIII was Supreme Head of the Church of England, occasioning a jurisdictional break with Rome. But the Mass itself continued in Latin, and clergy were not yet (openly) married. The Dissolution of the Monasteries had done its worst to divert the wealth of cenobites to support Henry's wars in Scotland and France, but the iconoclasm and church-wrecking despoliation under the Boy-King Edward was still to come. It's from this transitional moment of a catholic-but-not-papal and protestant-but-worshiping-in-Latin England that we get the Litany. It was the earliest of the "certayne godly prayers and suffrages in our natyve Englyshe tongue" decreed by Henry, who would not live to see the 1548 Order of the Communion or the 1549 Book of Common Prayer. It was meant to be sung in public procession, the priest or clerk intoning the petitions in an audible voice, and the choir or people singing the responses. It is the only time we are—at the phrase and finally to beat down Satan under our feet—both permitted and encouraged to stomp in church. For all its venerable origin story, and for all our sincerely looking forward to it during the parts of the year outside of Lent—indeed, for all our effort to find churches that use it—when we wake up on a Lenten Sunday morning there's a feeling of minor dread about the hour or so before the Litany. It's long. It's monotonous. It's repetitive. It's easy to screw up the switch between Good Lord, deliver us and We beseech thee to hear us, good Lord. The Litany is a slog, and this is by design. We're thankful that we know of no place in the world entire where the rubrical direction to recite it at Morning Prayer on Sundays, Wednesdays, and Fridays throughout the year is followed. But whether chanted in procession with incense or recited standing in a pew, the Litany is essentially identical to the text used by our Tudor ancestors 475 years ago—and in this there is a reassuring collapse of centuries. The text is a vehicle for the bringing of every human need to God's merciful care, every bit as encompassing of the concerns of a praying people under Henry Fidei Defensor as before and after a week during which hakas and tears met reasonless violence at mosques in New Zealand. Everywhen and everywhere, the Litany would have us know, every fear or challenge of life is right to bring to God in prayer. Although this no longer includes deliverance from the tyranny of the bisshop of Rome and all his detestable enormyties, it does include lightning and tempest; earthquake, fire, and flood; plague, pestilence, and famine; battle and murder and sudden death. It would be heretical presentism to imagine that there would ever be a time when we should not pray to be delivered from all blindness of heart; from pride, vainglory, and hypocrisy; from envy, hatred, and malice, and all uncharitableness. It would be a heartless congregation who failed to ask God to preserve all who travel by land, by water, or by air,* all women in child-birth, all sick persons, and young children; and to show pity upon all prisoners and captives. The repetition of the words, even at their great length and exhaustiveness of a Sunday morning, is a weaving into our awareness that in all our troubles we may put our whole trust and confidence in divine mercy. It was a wise Cranmer and a good church that gave us these sound words, and they are wise congregations who still use them, stomping and all. *Air travel is included since 1928 revisions in the United States, but was overlooked by the Canadian revisers in 1962. Users of the English BCP still pray only for persons who travel by land and by sea. File this away for pub trivia at an appropriate time outside of Lent.